In John 1:5, the Bible mentions that the world (darkness) did not comprehend Jesus. In other words, the creation did not recognize its Creator. People often misunderstood and misquoted Jesus, yet He remained focused on His mission of redemption. What is the mission that God has given you as a leader? How can you follow Jesus’ example and remain focused? We live in an upside-down world. Try the Mission: Pioneer Spirit study guide to help you see how a focus on Christ can turn your world right-side up. This entry was posted on Wednesday, June 28th, 2017 at 5:07 am	and tagged with focus, God's plan, John, mission, redemption and posted in Lay a Path. You can follow any responses to this entry through the RSS 2.0 feed. That’s an insightful way to view it. I’ll pass along your thought to others. I agree that many of God’s thoughts seem upside down to us not realizing that we are the ones upside down. Is it possible that we are like a camera designed with fixed focus. 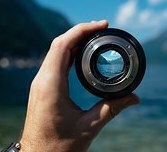 We see nothing in clear focus unless we are looking at Christ who puts all things into clear focus. An upside down thought?